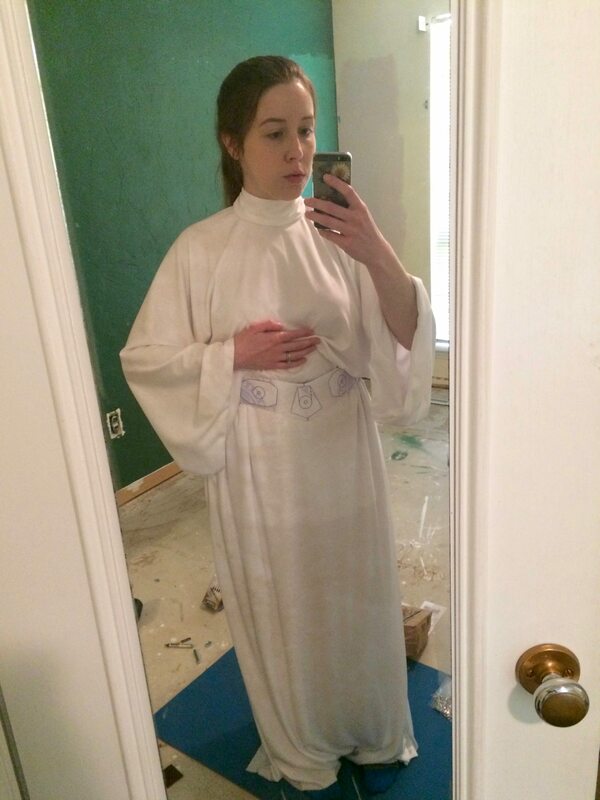 Rebel Legion :: View topic - Yet another Senatorial Leia WIP! 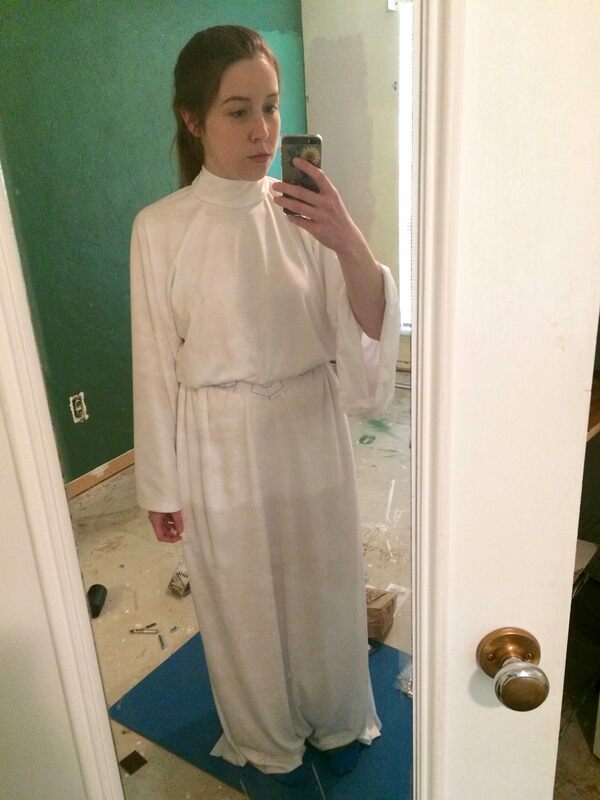 Posted: Tue May 15, 2018 5:50 am Post subject: Yet another Senatorial Leia WIP! 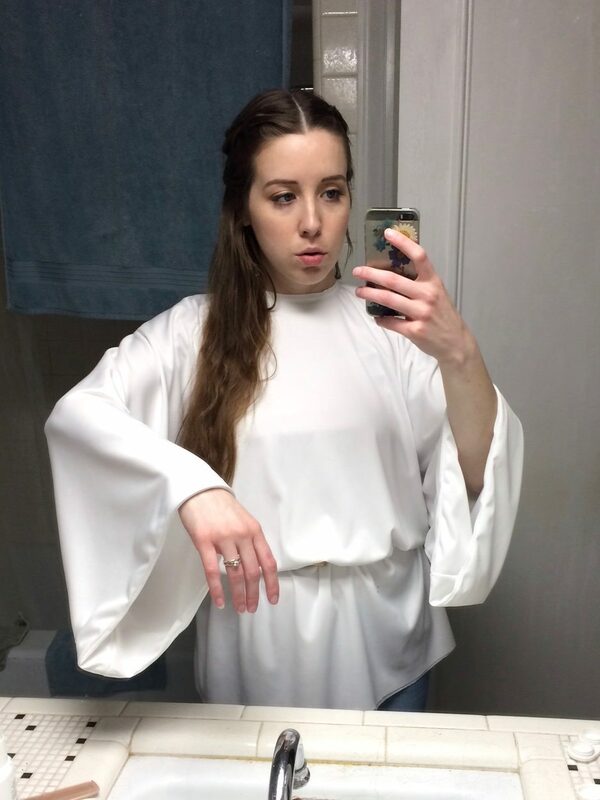 I'm taking the plunge into the most classic Leia costume there ever was! Because I'm crazy, I'm going to try and have it presentable by the Solo premiere. Sometime after that, after I've had time to work out any remaining kinks, I want to start the submission process and (hopefully) join RL! 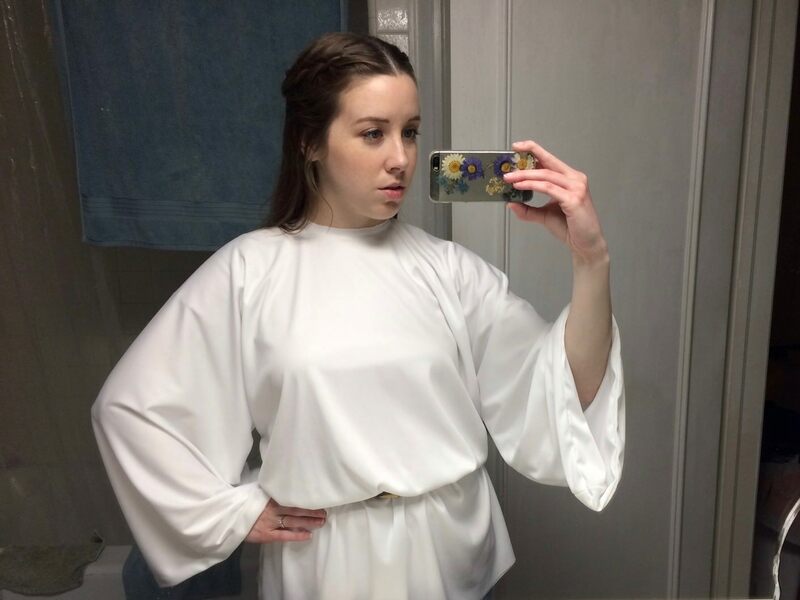 So far I've been using P & S Costume Creations' tutorial as my main guide (http://chucrew.com/Leia/leia.html), with some help from other stuff I've found on this forum, Padawan's Guide, the Bun Squad group on FB, and more. 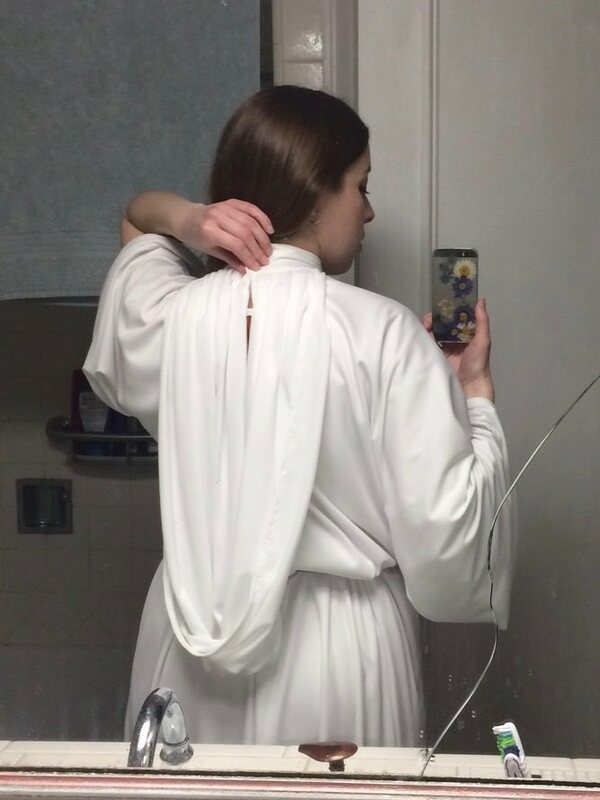 Since I ended up (mildly tragic story to come) making the dress in two parts, I'm also referring to Angel Monkey Studio's tutorial here: http://costumesandartwork.blogspot.com/2010/10/anh-leia-senatorial-gown.html. I bought 8 yards of Jet Set from Joann, some veg tan leather for the belt, Tarrego white leather dye, and the Dritz half ball buttons everyone uses (size 45 - 1 1/8 in). My husband's going to try and machine the aluminum plates. 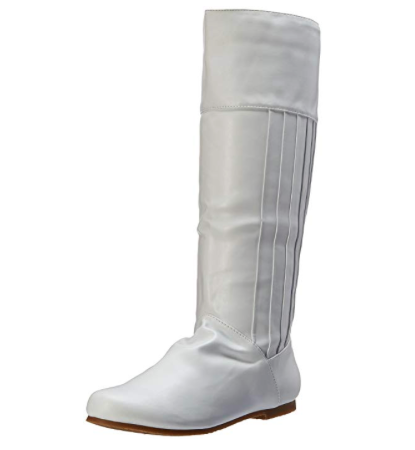 I already have some plain white leather boots that should do the trick (I'll post an image of them here later). 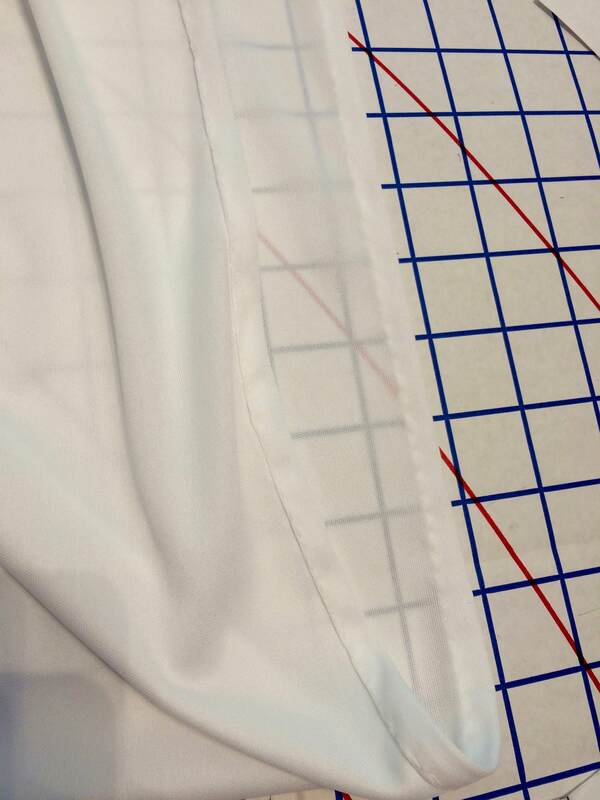 A few days ago I successfully got my fabric wrangled and folded properly despite my smallish workspace, and promptly began the process of making the pattern and cutting out the fabric. Unfortunately, I stubbornly continued working into the night despite being too exhausted to think clearly, and naturally I had a major mishap. I'm not sure what possessed me to go ahead and attempt to cut the keyhole but the results were suitably disastrous as I cut right through the front of the dress as well! After curling up in a fetal position for half an hour or so, I reached out to the lovely ladies on the Ladies of the Legions and Bun Squad FB groups and received not only kindness and sympathy but also the brilliant suggestion, like a ray of light straight from heaven itself, to save the bottom half, only buy enough fabric for the top, and sew a waist seam (I had not thought of this, being, as I demonstrated earlier, too tired to think). 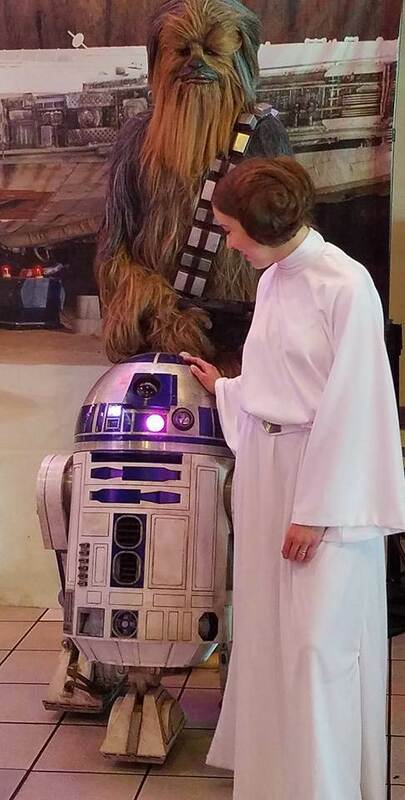 Feeling full of a new hope (get it? hahaha*), I went out and bought 3 1/2 more yards of Jet Set, thankfully still on sale. 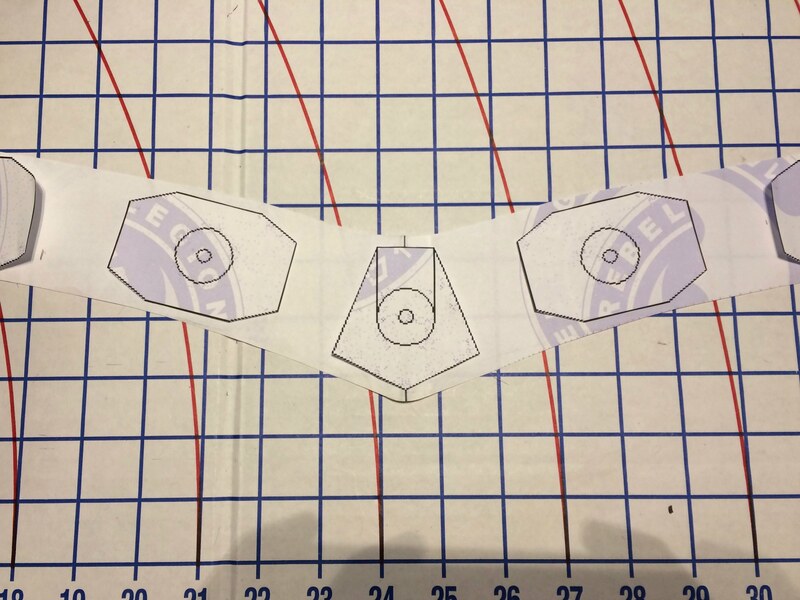 Today I successfully folded and cut it properly! 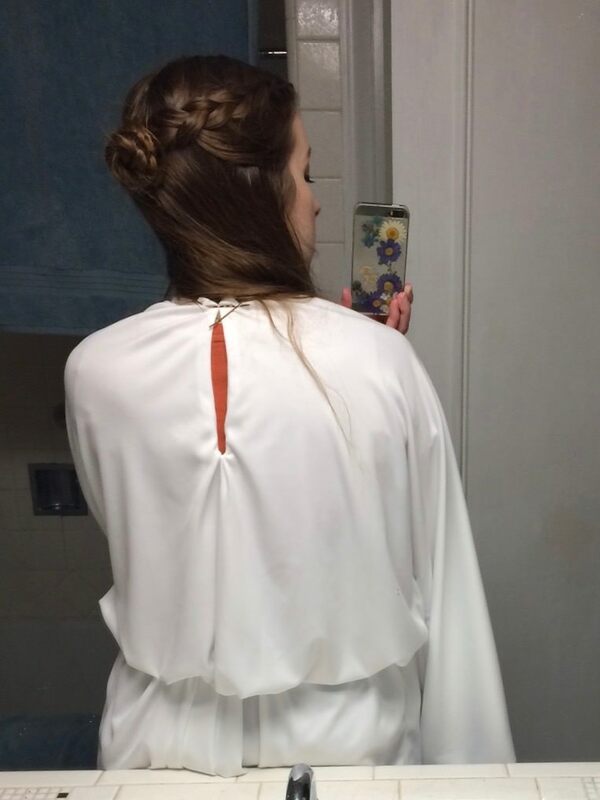 Following my celebratory dance, I sewed along the sides and the bottoms of the the sleeves of the top pieces. Then, I cut the keyhole (solely on the back this time! 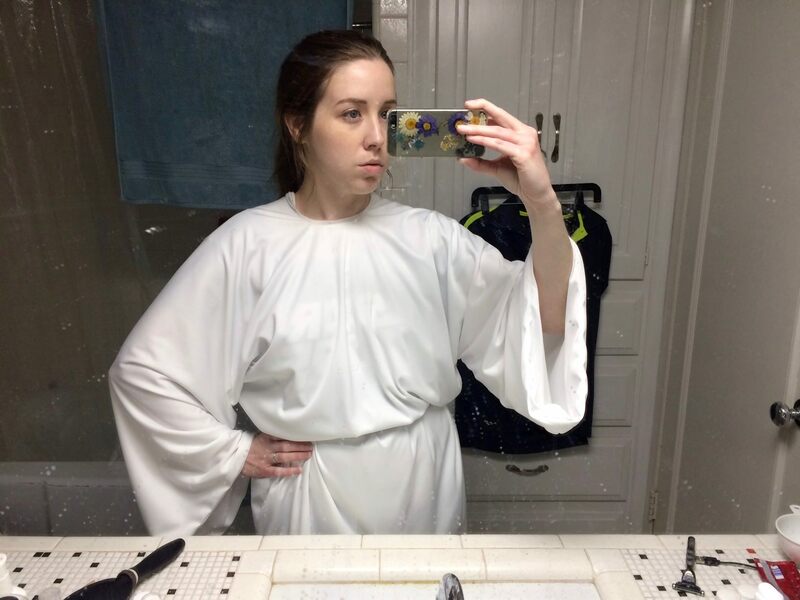 ), and after some experimentation I got the two layers turned inside at the edges and was able to sew together the keyhole and the sleeves (this is a hard-to-describe process, but see the links above). And then I promptly stopped this evening before my mind decided to give me the finger and skip off. 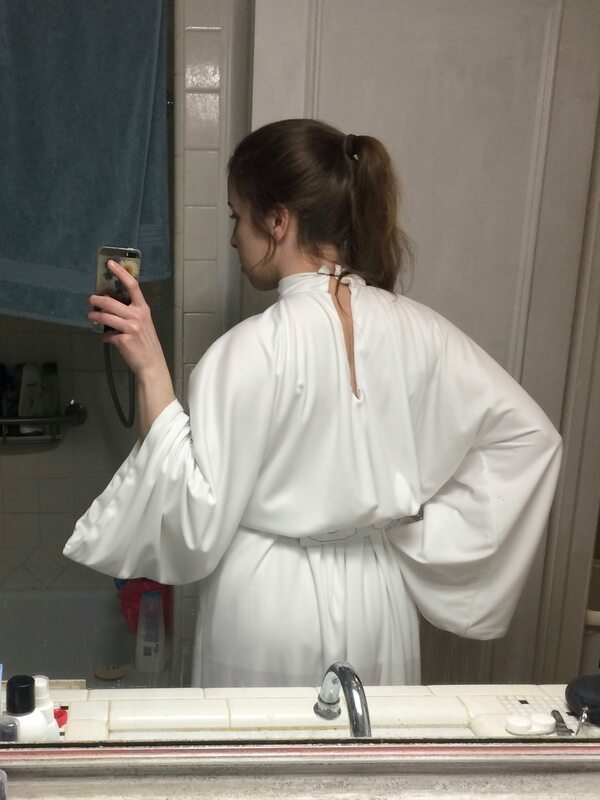 Does the length of the sleeves look okay (if you can tell from the admittedly limited perspective of these late night bathroom selfies)? Thanks for reading and thanks in advance for the feedback! Okay I'm back with a few more pictures after adjusting the neckhole for my apparently gigantic neck, lol. I'm much more happy with how it lays now! Any thoughts? 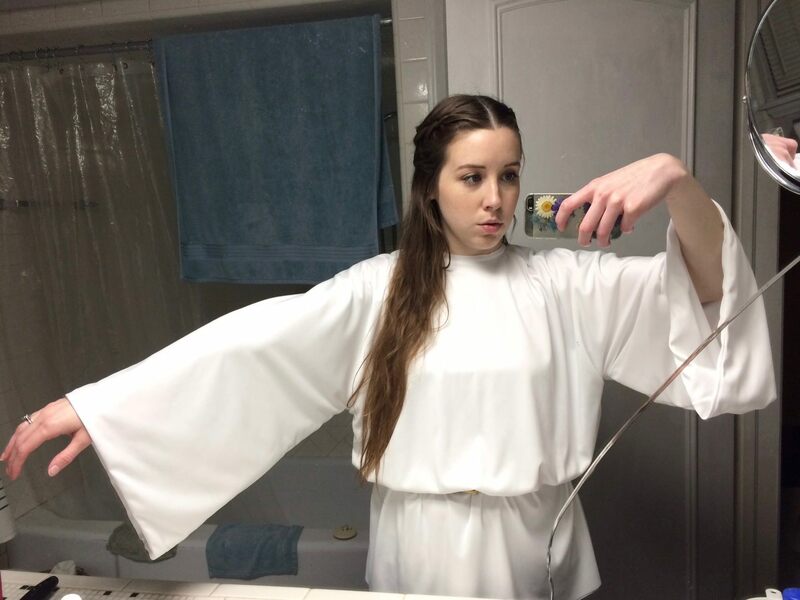 Does the arm length look okay too? I'm including a picture of the back this time. I'm not sure why the area around the keyhole is a little wrinkly at the bottom. I initially tried resewing it a couple times and that only made it marginally better than it was at first. Is this a problem, and if so, how do I fix it? 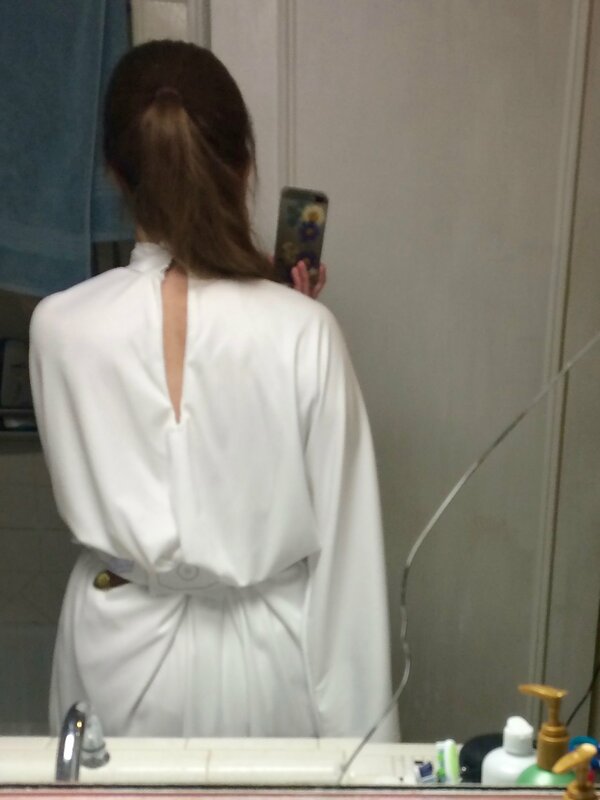 I'd like to get feedback on that before I add the collar soon so as to avoid more seam-ripping than I have to. After getting feedback on the Bun Squad FB group, I realized I had forgotten to make clips in the seam allowance! I did that and it helped immensely, though it still looks a little weird to me (see following picture). Any more suggestions or is it alright as is? I may play around with it a little more and see what happens. I think you have done some great work on this. A bit of light pressing should help with the keyhole/slit. Don't make your sleeves any shorter; they have a great length now. After a lot of trial and error, I finally figured out the collar. 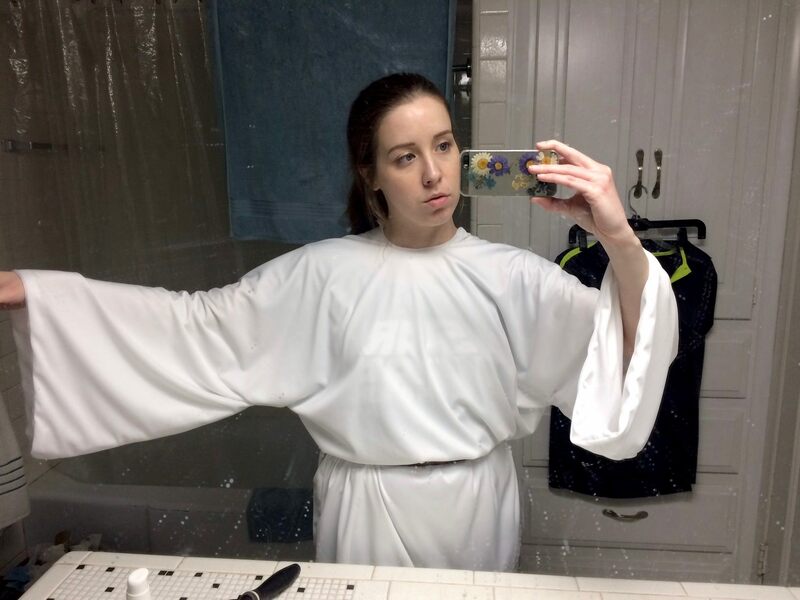 Also, I put together the skirt part and attached that to the top part where I think the waist seam should be (also with a lot of trial and error). I think I've got it right, now, but I'd appreciate any feedback on the pictures below re: whether there's enough blousing. Note that I haven't sewn the waistband elastic on yet and consequently it kept slipping down in the back despite my best efforts, so the blousing is admittedly pretty uneven and messy from the back, but just let me know if it's approximately right. Also note that I've left quite a bit of fabric in the waist seam allowance as I want to make sure the waistline's in the right place before I cut it down, hence the fact that it looks like I'm wearing a very short slip. I haven't sewn on the collar yet (waiting to sew it on with the hood) or put the hook & eyes on it, and I've got a bobby pin contraption holding the two ends of it together on the back of my neck, lol, so that's why it's not closed right. 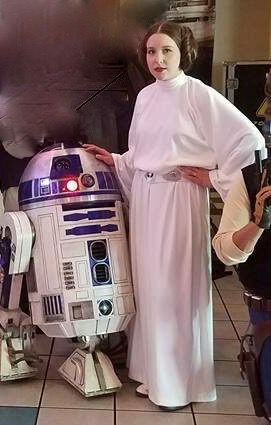 I got the hood cut out and hemmed it with a rolled hem, which I sewed by hand with a blind stitch (as in the original costume). No matter what I did the stitches weren't hidden completely on the front as they made the fabric pucker a tiny bit. I ironed it to try to get it to look smoother but this was the best I could get it. Does this look okay? Honestly it's not that noticeable unless you look really closely, and the photos of the original costume look fairly similar to my eyes, but because I'm probably overthinking this way too much I just wanted to check. How does all this look? 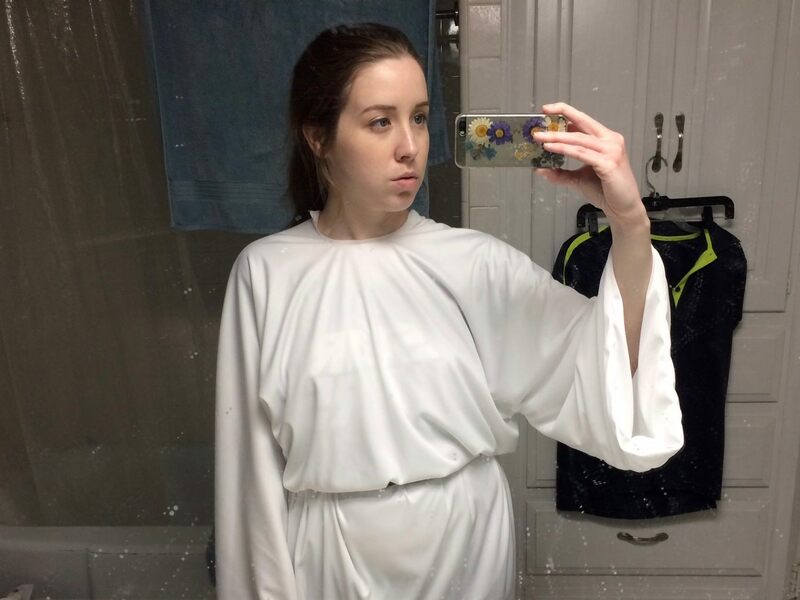 Next step is to cut out the leather and paint it, sew in the elastic waistband, and attach the hood and collar. 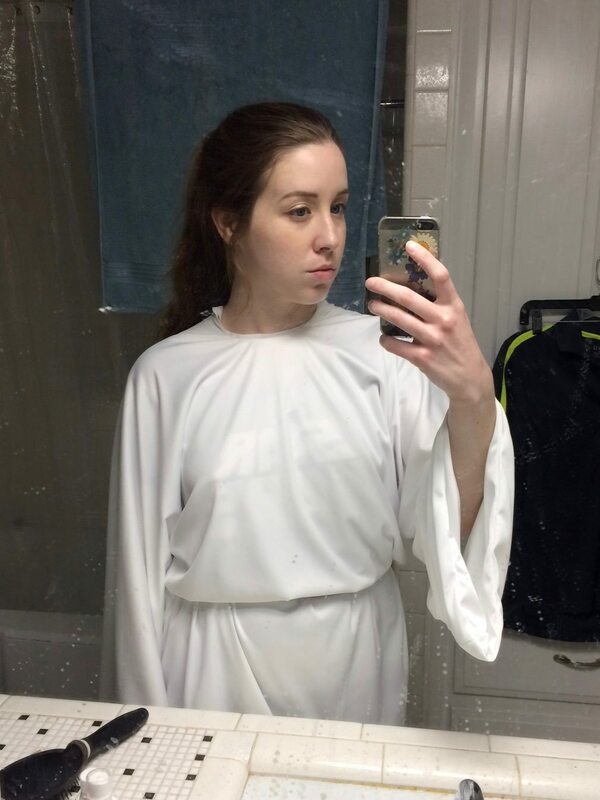 Alright, so I managed to meet my goal of getting this presentable in time for the Solo premiere! Next step: touch-ups then submit for Legion approval. 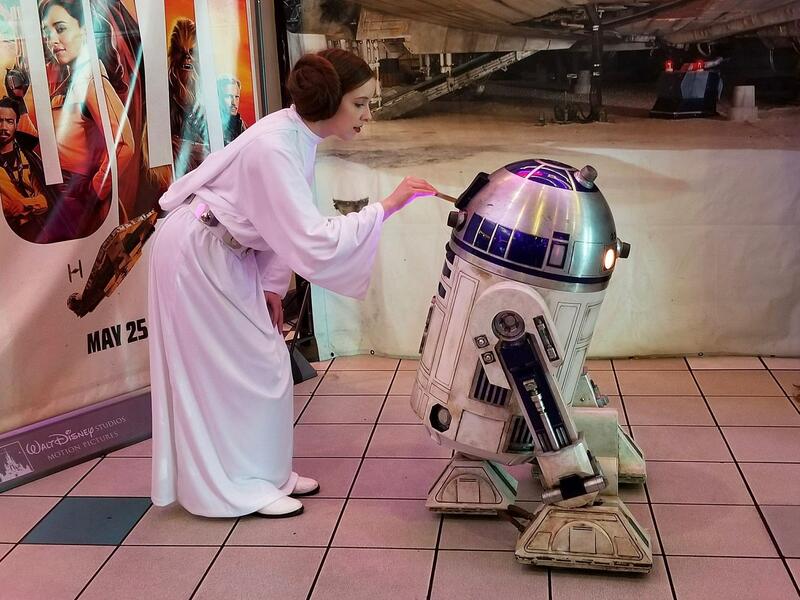 My husband's going to take some good, detailed pictures of me in costume next weekend (which I'm hoping to use to submit as well as post on here), but for now here's a few pictures from a premiere event I did. I would really appreciate any feedback you have for me! Note that I didn't quite finish my belt yet — I didn't get the button blanks glued on, so in these pictures they're held on with scotch tape as it was the only thing I could find in a pinch that remotely worked They held on for the whole night, thankfully, but they did shift around a bit. The plates underneath, even though they were curved, kept wanting to rotate as well (as you can clearly see in the pictures). I'm hoping gluing the button blanks on will sufficiently attach the plates to the rivets so that they won't rotate anymore, but if not, do you have any suggestions? Perhaps heavy-duty double-sided tape of some sort? I cut the belt out of 5-6 oz veg tan leather and dyed it white using 5 coats (at least, it might have been 6, I can't remember) of Tarrago white leather dye. I'm really happy with how the color turned out. It turned out to be a harder task than anticipated to machine the plates, so my husband cut them out of steel sheeting instead and bent them so they'd curve around my waist (I'm really happy with how they turned out, too). Next we drilled holes in the middle, then I punched corresponding holes in the leather and attached the plates to the leather with rapid rivets. I also attached four snaps to the back, which are hidden underneath the back plate. Finally, I finished the edges of the leather so they'd look more professional and so they wouldn't catch on my dress. It's hard to see in the pictures (both due to the rotating plates and some poor picture quality), but none of the plates when they're in their proper position meet the edge of the belt, as per standards. You can see in my earlier post the modified pattern I used. The finished thing has some extremely slight variation but that's basically it. 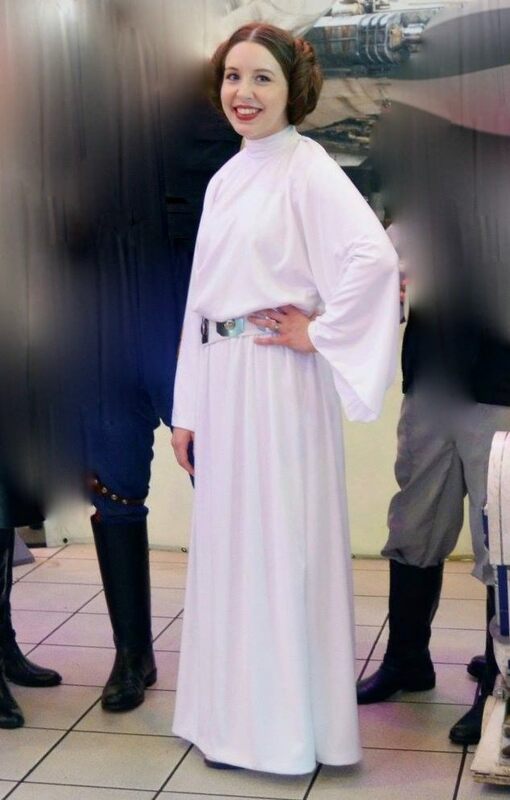 I really tried to make it look as close to pictures of the actual costume as I could. Thoughts? How do my buns look? After I touch up the belt, is there anything else I need to do to be ready to submit? You look fantastic! Your buns are especially smooth looking. I really like the sizing and spacing for your buns. Thank you so much, Jenna! 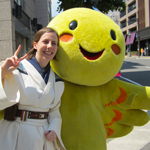 I followed the Padawan's Guide recommendation by Kay_Dee. I used 5 packs of Kanekalon Silky Straight hair (color: golden brown, in case anyone else wants to know). I read a number of tutorials, but I found it easiest for me to put my hair in two flat buns, attach the Kanekalon hair on top and then wrap that hair around to make the large buns. 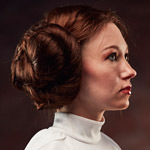 I noticed in a lot of pictures the center of Leia's buns are quite large, with the coil of hair getting smaller as it goes outward. I found doing it this way (as opposed to putting my hair in ponytails and twisting it into the Kanekalon) allowed me to get the right shape. - I got a pack of large bobby pins with one end of each of them curled like a corkscrew for a stronger hold. These were AMAZING (and I have really fine, slippery hair, so I don't say that lightly). I wish I'd had them when I was a dancer, because holy crap. I also found a pack of bobby pins with a "soft touch" and three different sizes, which I liked because they also gripped my hair extremely well (they were sometimes actually hard to pull out!) and they were matte instead of shiny, which makes them SO much easier to hide! I also used an assortment of regular and large bobby pins from my dancing days. SO MANY BOBBY PINS. But it worked! 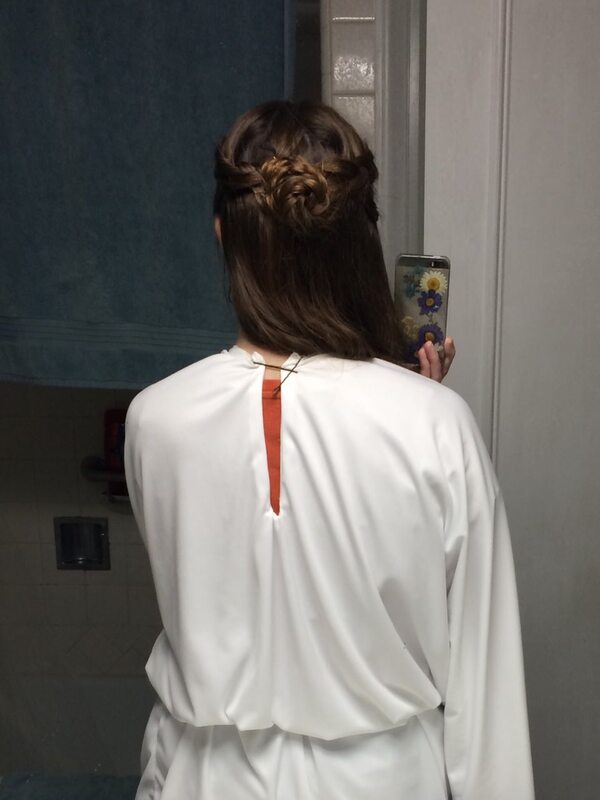 - I pinned the elasticked end of the Kanekalon hair to the top of the bun of my own hair with a corkscrew bobby pin (held it in place extremely well) and used some other regular ones to tame the ends. In doing so I made sure to fan out the Kanekalon hair so it covered my own bun (or at least most of it), then I started twisting it to wrap it around and cover the elastic and the Kanekalon ends. This all worked really well and seemed to be a big part of getting the look I wanted. Anyway, I got the buttons glued onto the belt earlier this week. 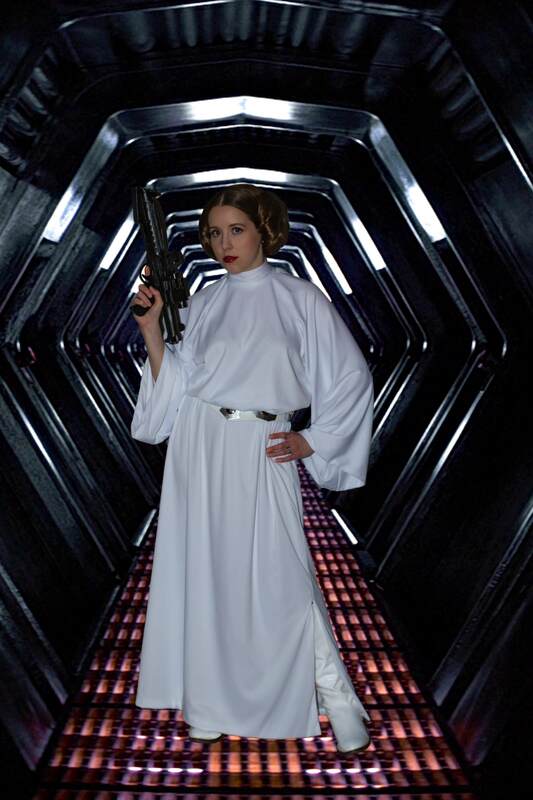 Tonight my husband took some pictures of me in costume and once he's edited them I'll submit! I'll probably also post a few of them here as my (hopefully) last update. I'm so excited! 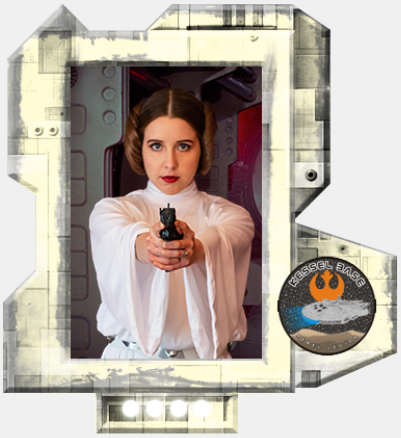 This looks amazing, Racheleia!! Great job! You have done a good job with this. 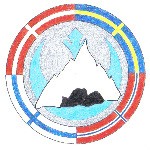 Very nice work. Update: Welp, my plans were foiled to submit in June — the pictures look great but I realized after I had taken them that, despite thinking I had succeeded in tacking down my belt plates, they were still trying to rotate. I've now glued them firmly down, but we'll have to do another photo shoot, and we've been so busy with traveling and other things that we haven't had the time to do so yet! Moreover, my Kanekalon extensions had lost a lot of hair/volume after wearing them numerous times over the past few months, so I need to get more — only problem is, they've been out of stock in my color (#10 Golden Brown) for a few months. Finally, I contacted Doctored Locks, and they said that my color has been discontinued! However they suggested getting a similar color in KK Smooth Seal instead and doing a hot water dip to straighten them. I just messaged them for more information on that and to see which color would match best. So anyway, all that to say, I have a bit farther to go now until I'll be ready to submit. Hopefully I can get the hair thing straightened out (literally haha) soon. 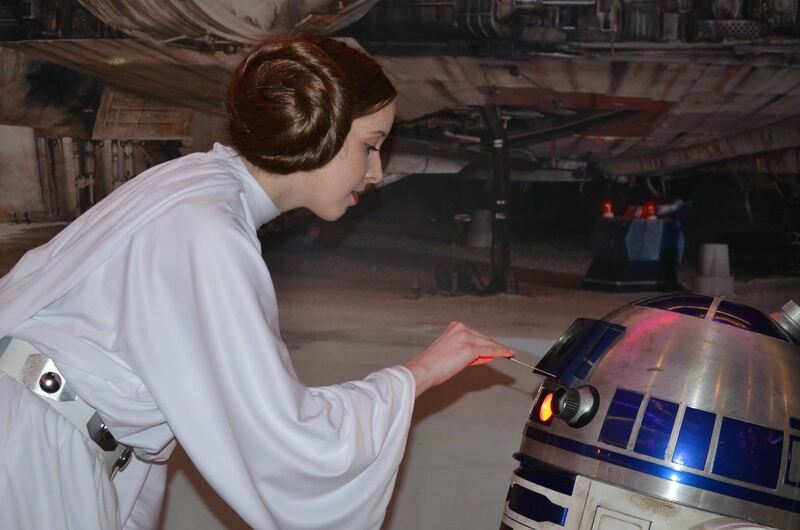 Daughter of Alderaan — thanks for your comment and advice! I will say I don't think the pictures I've posted do a very good job of showing where it hits (in one I'm bending over so you can't really see and another I'm up against our counter, which if you don't know how tall I am it might be hard to tell where it hits). In reality what you described is exactly where the hood hits, thankfully! 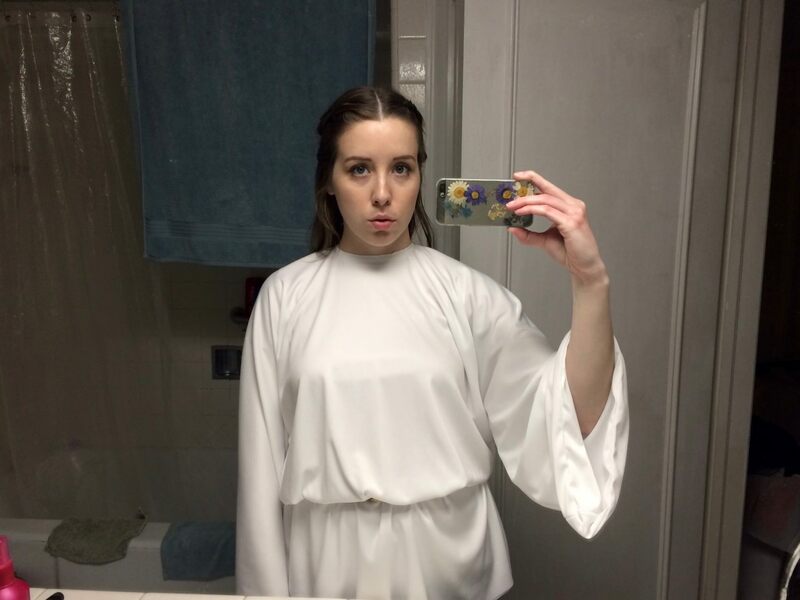 I will be sure to submit full-body photos of me from the back standing straight (and hopefully post them here too) so you can see. Update! I'm still working towards getting this one submitted, I've just had a busy summer and keep finding new things to nitpick about it. The last thing I'm going to do before we take more photos to submit is add an extra hook and eye or two to the back of my collar. I've currently only got two on there and it gaps in the middle. Let me know if there's any other last minute things I need to change! Hopefully I'll be submitting soon! You are looking good and it sounds like you've got it all in order. And I'm approved! Thank you all so much for your help!